Our current knowledge of the pre-Christian mythology and religion of the Norse and other Germanic peoples has been painstakingly pieced together from a large assortment of sources over the past few centuries. The most significant category among these sources is without a doubt the literature concerning mythological and historical subjects written in the Old Norse language from about 800 to 1400 CE, a span that includes the epochs we now refer to as the Viking Age and the Medieval Period. The Scandinavians and Icelanders held onto their traditional religion far longer than the more southerly Germanic peoples, and the Icelanders in particular did a remarkable job of preserving their heathen lore long after Christianity became the island’s official religion in 1000 CE. Were it not for the body of poems, treatises, and sagas that they’ve handed down to us, the pre-Christian worldview of the Germanic peoples would now be almost entirely lost. Old Norse-speaking poets have left us countless valuable clues regarding their religious perspective, but the collection of poems known today as the “Poetic Edda” or “Elder Edda” contains the most mythologically rich and thorough of these. Two of these poems, Völuspá (“The Insight of the Seeress”) and Grímnismál (“The Song of the Hooded One”) are the closest things we have to systematic accounts of the pre-Christian Norse cosmology and mythology. The name “Edda” has been retroactively applied to this set of poems and is a reference to the Edda of Snorri Sturluson (see below). The authors of the poems are all anonymous. Debates have raged over the dates and locations of the poems’ composition; all we can really be certain about is that, due to the fact that some of the poems are obviously written in a manner that places them in dialogue with Christian ideas (especially the aforementioned Völuspá), the poems must have been composed sometime between the tenth and thirteenth centuries, when Iceland and Scandinavia were being gradually Christianized. Among the prose Old Norse sources, the Prose Edda, or simply the “Edda,” contains the greatest quantity of information concerning our topic. 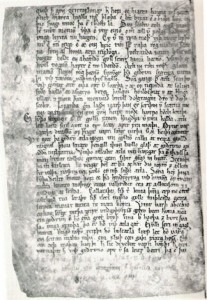 This treatise on Norse poetics was written in the thirteenth century by the Icelandic scholar and politician Snorri Sturluson, long after Christianity had become the official religion of Iceland and the old perception of the world and its attendant practices had long been fading into ever more distant memory. The etymology and meaning of the title “Edda” have puzzled scholars, and none of the explanations offered so far have gained any particularly widespread acceptance. Snorri made use of the poems in the Poetic Edda, but added to his account a considerable amount of information that can’t be found in those poems. In some cases he quotes from other poems that have been lost over the course of the centuries, but in other cases he offers nothing but his naked assertions. Some of these can be confirmed by other sources, and many of his uncorroborated claims are in keeping with the general worldview he describes, which makes scholars more inclined to accept them. Others of these assertions, however, appear to be simple rationalizations, attempts to reconcile the old mythos with Christianity, or other sorts of fabrications. Modern readers of Snorri have advanced widely differing appraisals of the value of his work. While it would be rash to simply dismiss everything in the Prose Edda that the earlier poems haven’t already told us, it would be equally presumptuous to accept every statement of Snorri’s at face value. Unfortunately, the latter approach was common throughout much of the nineteenth and twentieth centuries, and as a result most popular introductions to Norse mythology uncritically rehash Snorri’s contentions and thereby present a skewed portrait of the old gods and tales. Even though their definition of “history,” or at least what constitutes a reliable piece of historical information, might diverge considerably from our present understanding, the Icelanders of the Middle Ages have left us with numerous historical texts that add mightily to our knowledge of pre-Christian Norse religious traditions. While many of these, such as the priest Ari Thorgilsson’s Íslendingabók (“Book of Icelanders”) and the anonymous Landnámabók (“Book of Settlements”), don’t fit into the saga genre, the majority of these historical works are Icelandic sagas. The sagas were written primarily in the thirteenth and fourteenth centuries and recount the lives of famous Icelanders, Scandinavian kings, and Germanic folk heroes. Their literary style is as stark as the landscape of Iceland; events are described in a terse, matter-of-fact way that leaves much to the imagination and intuition. When elements of pre-Christian religion are mentioned, it’s almost invariably casually and in passing, as opposed to the more direct manner of Snorri and the poets. The most notable exception to this is the first several chapters of the Saga of the Ynglings, which give a thorough exposition of the character and deeds of many of the Norse deities, albeit in a euhemerized (trying to rationalize mythology by casting it as an exaggerated account of ordinary historical events) context. 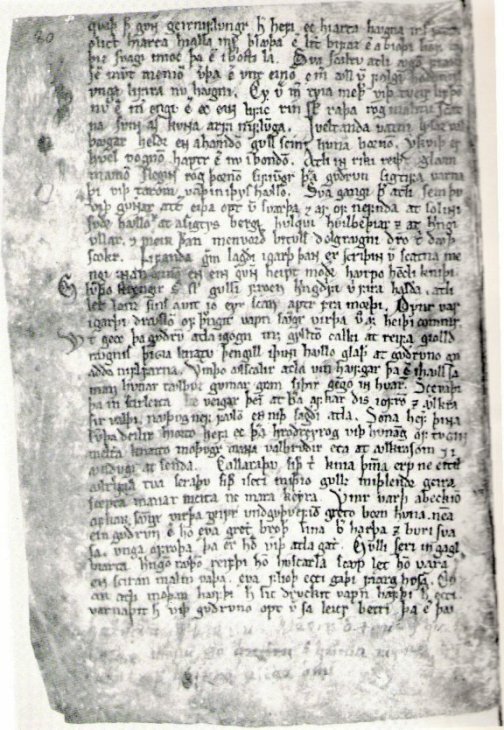 This same technique is used in the Prose Edda, which should be unsurprising, since the Saga of the Ynglings and the collection of sagas to which it belongs, the Heimskringla or History of the Kings of Norway, were also written by Snorri. Virtually all of the other sagas, however, are anonymous. Indispensable as it is, Old Norse literature isn’t our only source of information concerning the pre-Christian religion of the Germanic peoples. The Danish scholar Saxo Grammaticus wrote a Latin history of the Danes (Gesta Danorum, The History of the Danes) in the twelfth century that includes variants of many of the tales found in the Old Norse sources and even a few otherwise unattested ones. As with Snorri, these are presented in a highly euhemerized form. Late in the first century CE, the Roman historian Tacitus wrote a book on the Germanic tribes who dwelt north of the Empire. This work, De origine et situ Germanorum, “The Origin and Situation of the Germanic Peoples,” commonly referred to simply as Germania, contains many vivid descriptions of the religious views and practices of the tribes. The literature of the Anglo-Saxons, another branch of the Germanic family, contains several mythological parallels to some of the narratives and themes dealt with in the Old Norse sources. The epic poem Beowulf is the most significant Old English source, and the Latin work Historia ecclesiastica gentis Anglorum (“The Ecclesiastical History of the English People”) by the eighth century monk Bede contains numerous pieces of information concerning the pre-Christian religious traditions of the Anglo-Saxons. The continental Germans have also bequeathed to us accounts of their heathen traditions such as those found in the so-called Merseburg Charms, which are medieval prayers or spells composed in Old High German, and the Middle High German epic poem Nibelungenlied. Archaeology is the most significant of our non-literary sources. A plenitude of archaeological finds have provided striking corroborations of elements from the written sources, as well as offering new data that can’t necessarily be explained by the written sources, reminding us of how incomplete a picture the literary sources contain. The study of place-names has also yielded valuable evidence. Many sites throughout the Germanic lands are named after heathen deities, often combined with words that indicate a sacral significance such as “temple” or “grove.” This allows us to trace the popularity of devotion to specific deities across space and time, and often yields additional clues about the gods’ personalities and attributes, as well as those of their worshipers. Finally, the study of comparative religion has illuminated our understanding of the pre-Christian religion of the Germanic peoples by intelligently filling in some of the gaps in our other sources by connecting the known themes, figures, and tales from the Germanic peoples with those of other, related peoples. For example, esteemed historian of religion Georges Dumézil has shown how the Germanic myths are in many ways representative of much older Indo-European models, and others such as Mircea Eliade and Neil Price have analyzed the profound similarities between Norse shamanism and that of other circumpolar and Eurasian societies. Based on the above, you might be tempted to think that we currently have a very full picture of heathen Germanic mythology and religion. But such is certainly not the case. As I try to make clear in various articles on this site, the knowledge provided to us on these topics by our sources is actually very fragmentary. We do, of course, know many things about the ancient Germanic religion, but there are also gaps in our knowledge that sometimes seem as vast as Ginnungagap itself. To fill in these lacunae, we can avail ourselves of the time-honored techniques of informed guesswork and intuition, but there will always be frayed and broken threads that dangle tantalizingly at the outer edges of our knowledge, reminding us of the missing pieces that might still be available to us today were it not for the intervening centuries of the more or less malign neglect of that information.